Repetto Ranch Comestible Arts: Today's Haul. This is why I have to stop going to the local thrifts. Oh, if it were that simple! I ambled up to one of my favorite neighborhood junk stores, you know, just to stop in...see what's new... I am not buying anything.... I am NOT buying anything! 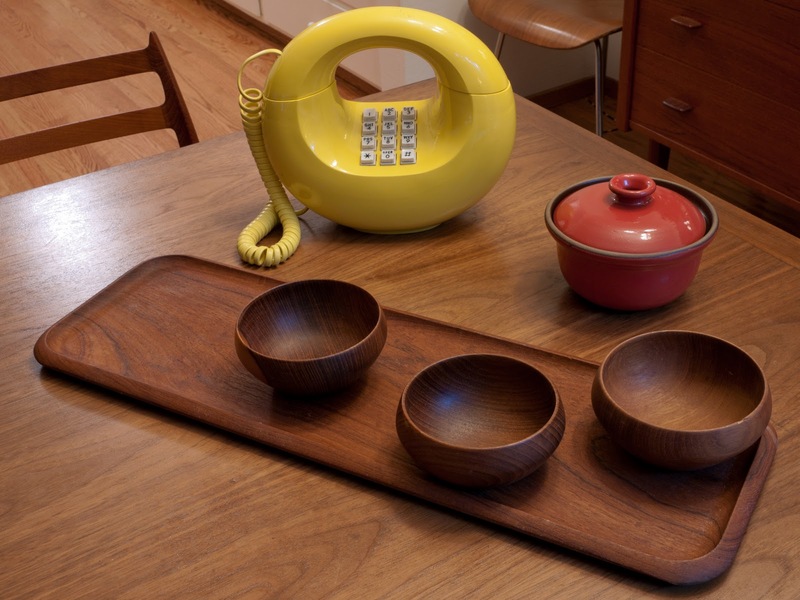 Why did this lemon yellow, Western Electric Sculptura phone have to be sitting there taunting me? The Sculptura, sometimes called the Donut, is probably one of the most iconic 1970s telephones. It was produced in three colors, yellow, brown, and white and made both in TouchTone or rotary flavors. I grabbed it and carried it around, still in my heart thinking that I would leave it behind when I left. It was the little Heath vessel that sealed my fate. Heath Ceramics is a Sausalito potter started by Chicago Art Institue alum Edith Heath way back when. Heath has pieces in the MOMA as well as my kitchen. Good thing I kept going, because I scored a fine Digsmed Danish teak platter and bowls at the Salvation Army in San Rafael later on. Who am I kidding? I can't stop. As this blog gets fleshed out, I may add commercial links to either ebay or etsy in case anyone wants to help me thin down a bit. you are a deal MAGNET! Beef Jerky, The Noblest Savage.